We've been a little hard-pressed lately to recommend laptops because the technology is changing so rapidly. What was state-of-the-art yesterday has become a state-of-the-past today. One of the major trends that's driving this is the fast-approaching merger of PDA compactness with the functionality of the PC. These small (and getting smaller) sophisticated compact computers are appearing with top-notch engineering, surprising portability and adaptability, and exciting features (and exciting prices too!). In coming issues, we're going to explore this innovative, little wonder which promises to make your computer-life a lot more comfortable and productive. In the meantime, we'll offer up for your consideration some full-range laptops that meet our tech/value guidelines and that we think would interest you. One of them is the Toshiba Portégé M700. Toshiba has a deserved reputation for intuitive design and quality manufacturing. The Portégé M700 extends that reputation and it features amazing convertibility — use it as a lap or use it as a Tablet PC. If you haven't worked with a Tablet, you're in for an empowering treat. The latchless display lid action (with a unique hinge and guide-peg mechanism) simplifies converting the M700 to a Tablet PC by easily snapping and locking the display in place. And that takes you to a terrific screen. 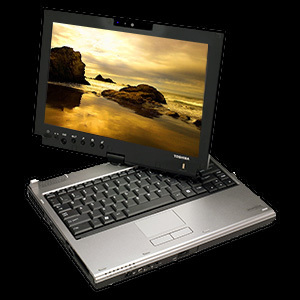 It has a 12.1” diagonal widescreen LED-backlit LCD display with 1280 x 800 (WXGA) resolution. The imaging is brilliant indoors and effectively bright outdoors. You can use the Portégé M700 any way you want — with a keyboard or digital pen, or even available touch screen capability. That's right, touch screen! It has a fast processor, lots of storage capability, and lots of room for expansion. It comes with a DVD SuperMulti optical drive in a modular “bay”, which lets you to swap in a second hard drive (for more storage) or remove it completely to save weight (the basic machine only weighs about 4 lb.). There's a built-in webcam and microphone for your casual "Skyping" needs or more serious video conferencing. One of its key accessories is its Port Replicator, which will dock all your desktop devices, such as printer, keyboard, monitor and charger for your battery.